An electronic dart scoreboard can add cool digital features to a traditional ‘analog’ dartboard. But are they worth the hassle? 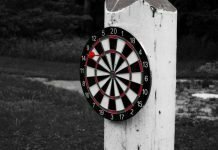 If you’re not ready to commit to a full electronic dartboard, these digital dart scorers can be used alongside a traditional bristle dartboard. Now you can have the authentic feel of steel tip darts and quality dartboard, but with added electronic features like scoring, handicapping and player rankings. While this is an intriguing concept, many players still prefer using a classic dart scoreboard with chalk or erasable markers. Let’s look at these two options so you can decide for yourself. First, why would you need to improve upon the traditional method of darts scoring with an electronic dart scoreboard? What’s wrong with the basic green chalk board or white dry erase board? 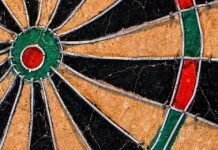 Like many of us, you might prefer the traditional method of keeping score in a darts match. These scoreboards can be mounted in a darts cabinet or next to the dartboard at the appropriate height. You just need chalk or a marker and an eraser. Classic dart scoreboards usually come pre-formatted with scoring columns for popular dart games like Cricket or 301/501. Depending on the game you’re playing, you simply write the players initials on the board and add any relevant scoring columns. If playing cricket, you just mark when a segment is hit using the X and O method, and keep track of scores in the left column. With 01 games, you subtract each the score of each turn from the running points balance. Pretty straightforward, and no batteries required. Yet there are some limitations to traditional scoreboards. For example, these scoreboards are not always the best option for scoring multiplayer games or other games beyond cricket. You may need more room for other players’ initials (although it’s common to have two boards, and that is enough for most us). And, most importantly, the math can get complicated and messy when you’re marking scores, and erasing previous scores and mistakes during the games. After many games, the remnants of earlier scores get harder to erase. And the scoreboard gets harder to read and unsightly. Luckily, you can still use pretty much anything to keep score of a darts match. Even a napkin and pen will do at times. Plus, a basic dry erase dart scoreboard or chalk board is not an expensive purchase, so buying a replacement is not a big deal. 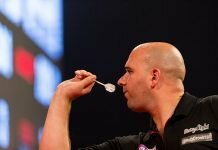 So, are electronic dart scoreboards worth a look? The big advantage to using an electronic dart scoreboard with a traditional bristle board, as I see it, is the number of games you can play. These digital scoring units come packaged with dozens of dart games and game variations. You just set the game and it automatically tracks the scoring, which you enter manually, according to the game you’re playing. This means that you can play 301 or 901 and not have to do any math. The board will automatically register segments, calculate scores and show you your points balance. 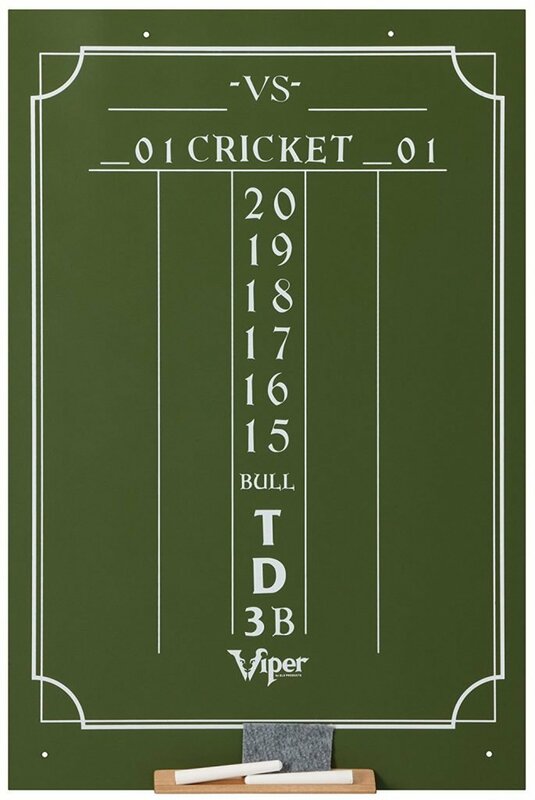 For example, the Viper ProScore Electronic Dart Scoreboard has 40 games with 600 options programmed and ready to play, including cricket and cricket variations (single player, doubles only, with or without scoring, etc. ), 301 – 901 games, Shanghai, Halve-It, Shoot Out, Killer and many more. You can add up to 8 payers for these games. Many electronic dart scoreboards include handicapping and ranking features. For instance, you can add a handicap level (i.e. 1 – 4) to a player before the game. The game will begin with pre-marked numbers, if playing Cricket, for the higher handicap player in order to level the playing field. The board will also record games and rank players based on win/loss totals. While you can mount one of these scoreboards within a dartboard cabinet or to the wall, you can also take the scoreboard with you when playing on a different board. It will store the info, and you can introduce some new games to players at a different location. These boards are battery powered and easy to remove. 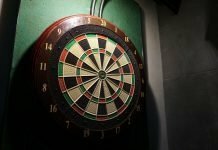 For many players, using a nice bristle dartboard with an electronic dart scoreboard offers the best of both worlds: authentic feel and quality combined with a digital interface, memory and computer functionality. Some scoreboards, like the Touch Pad Scorer from Arachnid, even let you play against the computer. 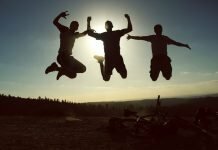 This can be a fun and challenging alternative to practicing or playing solo dart games. The addition of LED lights and voice prompts are also a nice touch. With all the bells-and-whistles, there are still some negatives to using an e-scoreboard. First, an electronic dart scoreboard is relatively small. Don’t be deceived by the pictures. Some of these boards, including the Viper ProScore, are only about the size of a large calculator. That’s a lot of information crammed on to a small screen that must be visible from a dart throwing distance. Also, the red scores, which are LCD back-lit on the ProScore, can be difficult to read. Like electronic dart boards, these scorers are usually powered by either A/C or batteries. The Touch Pad takes 4 AA batteries for instance. 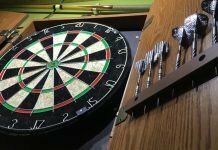 While it’s nice to have options to power the scoreboard, adding power is not something you normally need to worry about with a simple bristle dartboard setup. Most electronic scoreboards have automated sleep functions and don’t draw much power. Battery life is decent as well. It’s just more of an inconvenience. Although the scoring and game formats are automated, you still need to input your score and set up the game. With some electronic scoreboards, it takes some time to learn how to program the game, adding another level of complexity to a game that should be pretty simple. We’re ust throwing darts at a board after all. Yet the manual entry is better on some boards than others. With the Touch Pad Scorer, for example, you just touch the corresponding segment on the scoreboard to register your score. You can touch single, double, or triple and it will calculate scores and update the game. While I appreciate the advantages and functionality provided by a digital darts scorer, and certainly understand why others like these when combined with a nice bristle board, I still prefer the basic ‘analog’ scoreboard. More specifically, I like a green chalk scoreboard mounted within a cabinet. That’s just my personal preference, though.